The snow has finally melted and the trees have bloomed and it’s allergy season! I field a lot of questions and requests for products and consultation from May through October. As a part of my initial consultation I ask every client about respiratory health in general and the presence of allergies. I do not have a set protocol for seasonal allergies, rather I have a body of remedies I keep in mind whenever a client discloses allergies, choosing from among these remedies based on other symptoms and the overall constitutional pattern of the client. Try this approach with your clients or friends and family members with allergies. The herbs described below are extremely safe and free from the side effects of OTC and prescription medications. In my practice I favor very low doses, sometimes called drop dosing, which I find to be very effective when a careful history is taken and tongue assessment and pulse testing are used. I’ve included more conventional tincture dosages in this article for the benefit of those readers who don’t practice tongue assessment and pulse testing. As an aside, I encourage all herbal students to learn these valuable techniques–they will transform your practice! Nettle (Urtica diocea) While freeze dried Nettle have a the reputation for being most effective for allergies, I find the standard fresh plant tincture to be perfectly effective. Nettles are specific and reliable for hives. Other indications include other skin conditions like eczema or acne, urinary tract issues, poor kidney function, hypothyroidism, anemia, low energy. Sometimes the tongue is dry, sometimes it is swollen and pale. The skin is often pale and soft and sometimes pasty looking.I like to say Nettles are the herbal kick in the pants to an overall sluggish system. If I know the client to be an avid tea drinker or wild foods enthusiast, I may recommend infusion from dried herb and/or encourage the use of nettle as food when in season. 1-2 8oz cups of tea daily, made to desired strength. 1 ml tincture, 2 x daily, is a good place to start, however, clients could safely consume much more. Goldenrod (Solidago canadensis) I use fresh tincture of Canada goldenrod (the most abundant species in Minnesota), although many species of goldenrod are widely distributed around the country. Goldenrod is a complex and interesting herb with a history of diverse uses including for respiratory symptoms. I learned from my teacher, Matthew Wood, that goldenrod is useful for allergies, particularly allergies to animal dander. Other indications include allergy with fatigue, and inflamed eyes. In my practice I find it very helpful for children with eczema, who very often also have seasonal, food and environmental allergies. Other indications: poor digestion and thick, greasy tongue coating. If not drop dosing try ½ ml tincture, 2 x daily. Dandelion Root (Taraxacum officinale) Dandelion Root is the classic Western alterative. It has been used for dozens and dozens of symptoms and conditions. It is very useful for allergies, sinus infections and inflammation. The tongue is usually red with coat peeled off in places called the mapped tongue or a geographical tongue. I use drop doses to ½ ml tincture 2 x daily but clients could safely take much more. Plantago (Plantago majus) Yes, humble little Plantain, famous as a first aid remedy is an alterative, albeit a mild one. Additionally, it’s a great oral remedy for the sinuses and mucus membranes. Tincture from fresh leaves is soothing and reduces inflammation. It both moistens dry conditions and astringes excess mucus. It is particularly helpful for dry or inflamed mucus membranes, postnasal drip and painful sinuses. Plantain both orally and topically help mitigate extreme symptoms from mosquito and other bug bites. Try 1/2 to 1ml tincture, but clients could safely take much more. A second strategy I employ when indicated is the use of cooling, bioflavonoid rich herbs which are useful when the client presents with a hot constitution with symptoms like seasonal allergies, inflamed mucus membranes, other autoimmune conditions, restlessness, nervous energy, anxiety, self reports as hot, has signs of heat in the tongue or appears flushed. Many rose family plants besides the two listed below would be appropriate . Lucky is the client who is provided with these markedly cooling herbs because taste delicious, often fruity or floral flavored. Hawthorn (Cratageus spp.) Both the berries and blossoms of Hawthorn trees are used in herbalism. Hawthorn can be a great help to inflammed and hot people with seasonal allergies. Other indicaitons include ADHD, hypertension, hemorrhoids and varicose veins, other cardiovascular disease. Like Nettles and Elderberry, Hawthorn occupies that space between food and medicine. Folks can take 1 ml tincture 2 x daily. Or as a delicious syrup: 1-2 TBS with breakfast. You can read my full profile of Hawthorn here. Wild Cherry Bark (Prunus serotina) Wild Cherry Bark is the best remedy for extreme heat and inflammation in the sinus tract and throat. The folks that need it often have a very red tongue body, that may be pointed or flame shaped. It’s a great moderator for an overactive immune system. Allergies can be thought of as a the result of an out of whack immune system, one in which the body is dramatically overreacting to harmless substances like pollen or dust. It is also useful for all manner of other autoimmune conditions where heat is apparent. It is famous, of course, as an herbal cough suppressant, when there is an irritated and relflexive cough with no mucus to bring up. 5-10 drops, 2x daily. Safety concerns with Wild Cherry Bark make lower doses anddrop doses more appropriate. Not considered for long term usage at higher doses. You can read this full profile of Wild Cherry Bark here. Linden (Tilia spp.) Linden is a wonderful cooling remedy. It is well suited for allergy sufferers who are hot and have inflammation. Other indications include fever and upper respiratory tract infection, insomnia, mild to moderate hypertension and ADHD. It is a reliable nervine and help promote more restful sleep Try 1/2 to 1 ml tincture, 2 x daily. 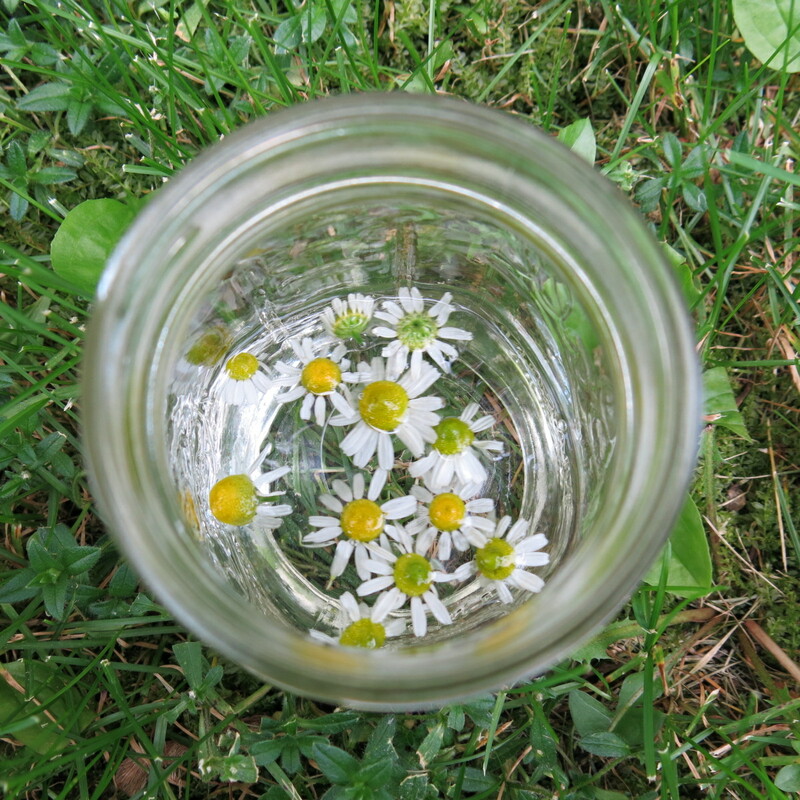 Chamomile: I use a combination tincture of Roman, German and our local naturalized pineapple weed. The powers of humble chamomile are grossly underestimated. Chamomile is a fantastic and effective anti-histimine with specific affinity to allergic symptoms of the eyes (itcy, dry, achy irritated). I use it in tincture but have also found it effective as an infusion . (1 tsp per 8 oz boiling water, covered, steeped and taken as desired). I use chamomile in lieu of eyebright (which is more famous for eye symptoms. eyebright does not grow in my locale). 1 ml tincture, 2 x daily. Or tea, if desired. Ragweed (Ambrosia spp. )Both local Ragweed species are used to treat seasonal allergies based on the homeopathic principle of like treats like. I tincture fresh leaf before flowering. Homeopathic preparations are available commercially. Caution should be exercised with this remedy. It should be ascertained that the client has never had a severe allergic or anaphalactic reaction. Microdoses should be used. When in doubt use the homeopathic potencies. Raw, local honey, taken by the spoonful or a few grains of local bee pollen may be tried. Some folks find these remedies helpful over the long term. They may alleviate allergies to local pollen, likely working either on homeopathic principles. Some clients with seasonal allergies may be deficient in essential fatty acids, particularly those that have other symptoms like dry skin, acne, eczema, food allergies, asthma, hyperactivity and attention issues in children and depression in adults. Such clients may choose to supplement with high quality fish oil or if vegetarian flax oil or some other essential fatty acids supplement that can be purchased at the local co-op. Clients may follow dosage guidelines printed on the label. Essential Oils in a diffuser, room spray or a topical preparation may be helpful for relieving congestion and inflammation. There are many to consider. Lavender, Eucalyptus and Peppermint are excellent choices that are commonly available and affordable. If there is a dry , itchy, inflamed feeling in the eyes, sinuses or throat, avoid the warming, pungent aromas you would use for a winter head cold like Camphor, Thyme or Nutmeg. Here’s a great article from Herb Geek with the approaches to allergies and hay fever from 5 prominent herbalists. You’ll find some overlap with my favorite Midwestern herbs, but lots of other ideas as well.